Yesterday (8 July), Gezi Park was finally re-opened to the public after being closed since the 15th of June. On the 6th July, Governor Mutlu had said that the park would open on Sunday (the next day). Later, he had gone back on his statement to add, it might be Monday the 8th. The 3 week long closure for the park was justified on grounds of cleaning up the park. Around 13.00, Ist. Governor Mutlu, Ist. Chief of Police Çapkın and Ist. 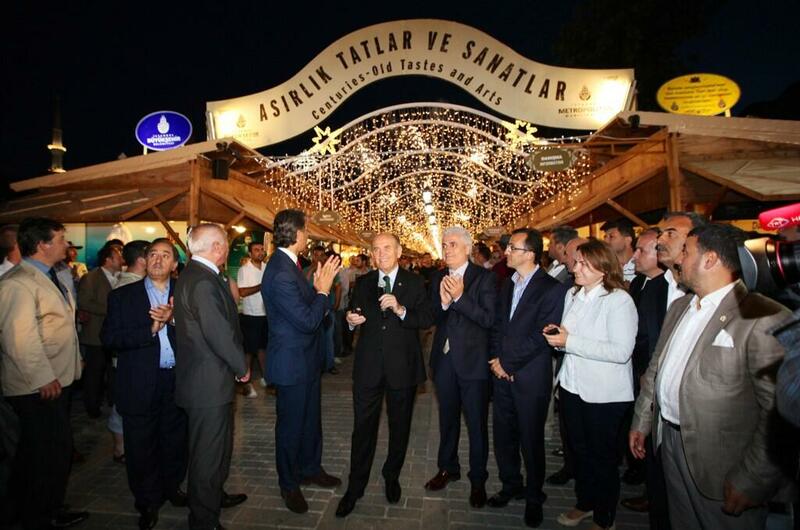 Mayor Topbaş – in short, Istanbul’s least popular figures- made their final ‘inspections’ around the park and opened it to the public. 3 hours after the opening ceremony, the park was closed once again. The park closure was accompanied by tear gas and water cannons to force the public out. The resistance grew with the arrival of more protesters who wanted to enter the park. Reports throughout the night show that the riot police have intensified their usage of rubber bullets. 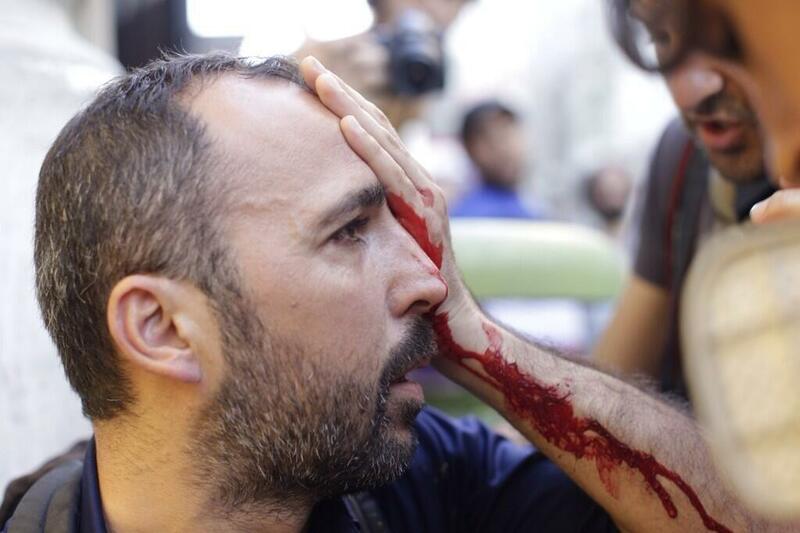 Once again, there were large numbers of detentions (protesters and journalists ) and injuries. In short, the Turkish government has renovated the park but are too afraid to open it up to the public. When open, the presence of ‘the wrong crowd’ in the park is excuse enough to roll the troops back in to flush them out. The lie that Gezi Park was opened to the public didn’t last long this time. A short while ago, constituents of Taksim Solidarity who were trying to get to Gezi Park were stopped on İstiklal Street, the police has once again attacked the people with tear-gas and water cannons and 35 people who are representatives and leaders of workers groups, democratic mass organizations who are constituent parts of the Solidarity were detained. As of this moment, the Secretary of the Chamber of Architects Mücella Yapıcı, architect Cansu Yapıcı, 2nd Chair of the Chamber of Architects Sabri Orcan, İstanbul Medical Chamber General Secretary Ali Çerkezoğlu, TMMOB İKK representative Süleyman Solmaz, Chamber of Urban Planners Secretary Akif Burak Atlar, urban planner Sezi Zaman, HDK Cetral executive member Ender İmrek, Hakan Dilmeç, TKP MK member Erkan Baş, EMO İstanbul branch president Beyza Metinler, İclal Bozkaya, Aral Demircan, EHP administrator Emre Öztürk, Kamil Tekerek, Ongun Yücel, İsmail Sürücüoğlu, Halit Güven, Haluk Ağabeyoğlu, Elçin Fırat, Ali Akgün Ekici, Murat Sezin, İsmail Bozkaya, Ayşe Adanalı, EMEP administrator Ercüment Akdeniz, FKF spokesperson Erçin Fırat, Sevil Kahraman, Ahmet Aktaş are under arrest. Why keep the park closed? Governor Hüseyin Avni Mutlu stated that the park was re-closed because of anti-AKP protests at the opening ceremony. He pointed at the Taksim Solidarity in specific but the protesters in general for provoking the closure of the park. In addition, Taksim Solidarity had called on all individual forums across Istanbul to hold a communal forum at Gezi Park, the centre and symbol of the whole movement that evening. This is the defining factor that led to the ‘preventive’ disproportional violence that raged on until the early hours of the next morning. My previous post is a transcript of the governor’s press statement where he explains why the park was closed. He makes clear in no uncertain terms that the Gezi Platform and the protesters are responsible for all the negative impacts the events of the last month have caused. He expressly isolates the mass of ‘marginals’ for breaking the law and states that mass assemblies will not be permitted. Thus, the park is perpetually opened and closed because the AKP government is one that does not accept criticism, is not open to dialogue and in the habit of turning a deaf ear to outcries voiced by protesters. In fact, over the 3 terms the AKP have been in power, they have shown that they are hostile and heavy handed even against peaceful and democratic protests. From the other side, the grievances of the protesters who are not being seen as part of the public are growing every day because of the way their demands are consistently being ignored, not to mention the injustices that are suffered for voicing objection against the government. The domestic reality is that the protesters or those who attend the forums have no outlet other than public spaces to bring to the government’s attention their discomfort. They do not have a square (in retaliation to Mutlu’s speech). Hence, if not allowed to protest, they can only have their voices heard in forums. The forums are a hugely positive development in terms of its ability to bring together large crowds of people who have antagonistic beliefs and un-matching lifestyles. In a country like Turkey which has numerous societal divisions, tolerance is a hard but important lesson to learn. The forums are a step in the right direction in that regard. At the same time, the force that has brought such antagonistic groups together is their mutual frustration with the way the AKP govern. This is why most of the discussions that take place in forums are more organisational in terms of how to further the protest movement. Because of this, the AKP can not read recent developments as positive and see such assemblies as a statement of insubordination. This is why the call for a public assembly (forum) to be organised at Gezi Park provoked the governor to close the park once again. As it stands, the park was opened around midnight on the 8th of July. But the unnecessary escalation of events yesterday resulted in impromptu demonstrations in cities across the country, starting with Izmir, Ankara, Eskişehir, Mersin and Antalya. Due to the government’s intolerance against criticism, all voices in opposition are regarded as a ploy to overthrow the democratically elected AKP government. The witch-hunt against those who have either shown support for, or been central in the protest is motivated by this belief. – A number of Erdoğan’s statements over the past month (also throughout AKP’s 3 terms in power) have targeted artists and intellectuals. The neighborhood of Cihangir (close to Taksim) is highly populated by citizens from this profile. The ‘scorpion’ police jeeps have been going up and down the streets of Cihangir, tear gassing small crowds of people throughout the protests who were trying to flee from the riot police in Taksim. Although not worded directly, this is a way for the AKP to say, “I have a problem with Cihangir”. – Over the past few days of protest, a small number of incidents have occurred where ‘counter protest’ citizens with sabres in hand have taken to the streets. Luckily, no one has lost their lives in such incidents as of yet. However, the double standards applied to protesters and ‘counter-protesters’ is another issue that angers those who are part of the protest movement. On the 6th of July, 8 people were detained in Taksim for protesting and one man who owns a corner shop was taken into custody for attacking the protesters with a sabre. Initially, the anger was against footage that showed the riot police running just behind the man with the sabre and not arresting him after he attacked protesters. In short, the police who have not shown any remorse to protesters is in the habit of turning a blind eye to the violence shown towards protesters. In this case, whilst the man with the sabre was detained, he was released after a short questioning whereas the 8 detained for taking part in the protest are still under questioning. Having said this, similar events took place on the 8th of July and the government seems to have taken a step back in this regard and is prosecuting the violent anti-protesters. – Both the governor’s last statement, and Erdoğan’s general arguments highlight the financial damage the protests have caused on the local artisans of Taksim. Whilst this is definitely true and is unfortunate, the ones who are to blame for this reality are not the protesters, but the administration that unleash the riot police into the streets without cautioning them against the use of rubber bullets, tear gas and water cannons. During the peaceful phases of the protest (eg. when the police backed out of the Taksim Neighbourhood and allowed the occupation during the early days June) and also in neighborhoods like Kadıköy, which have busy forums every night but no police intervention, business is better than normal. This should not be that hard to understand: more people there = more sales for artisans. Thus, the issue is not that protesters kill the livelihood of artisans, but that police presence or intervention kills business. – The AKP’s usage of the judicial system to silence dissenting voices is possibly the most important factor that provokes anger. Taking in a renowned and revered architect like Mücella Yapıcı because she is a member of Taksim Solidarity Platform is not a way of achieving public security. Such actions only show that the government has not understood what this movement is about but rather prefers to intimidate those that stand against the government. – The term ‘provocateurs’ has been widely circulated and associated with the actions of the protesters. Giving the governor of Istanbul the ‘Golden Compass Public Relations Award of the Year’ amidst calls for his resignation by protesters is one example which shows the extent of state provocation. * The day the park was opened (8th July), Deputy PM and party spokesperson Bülent Arınç made a press statement after the Council of Ministers’s meeting. In response to a question in relation to the Gezi Protests, Arınç stated, “We did not discuss this matter in the council. It is not a topic worth talking over”. 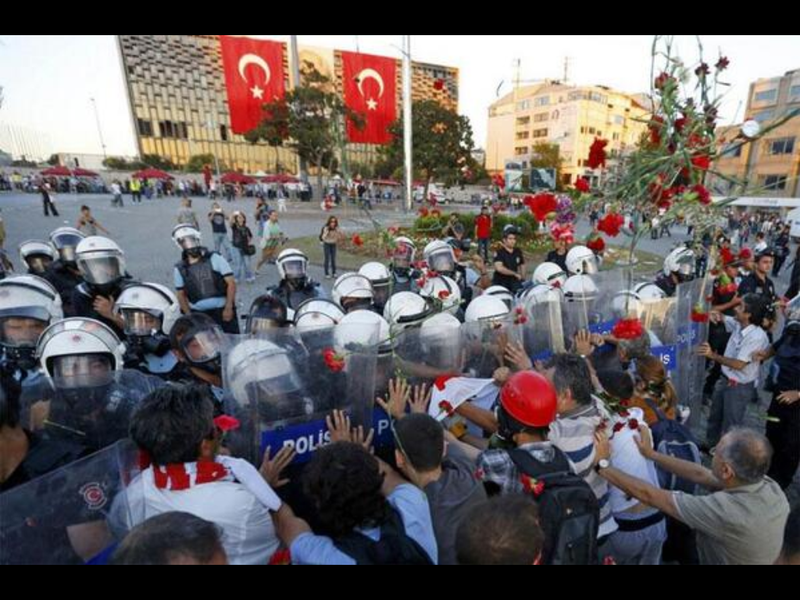 First of all, in a similar manner to the Gezi Protests, mainstream media outlets have been guilty of auto-censorship. Thus, the information to be gained from television outlets have been scarce and official statements do not reflect the incident that occurred in Lice (a town in Diyarbakır) on the 28th June where 1 person lost his life and 9 were wounded. The main information medium has once again been twitter. In summary, a group of 200-250 walked to the Kayacık town police headquarters to protest the ongoing re-construction. After tensions escalated, the Gendarmerie decided to intervene. Whilst live bullets were used – on top of the usual tear gas a sound grenades, official sources state the Gendarmerie fired in the air whereas BDP have been stating that the protesters were aimed at directly. According to Diyarbakır Mayor Kıraç, a group of 50-60 protesters from amongst the whole group threw molotov cocktails at the construction worker’s tents and the under construction headquarter building. The Lice incident is significant on two grounds. One is its place within the Kurdish Peace Process and the second is the support it has found within the Gezi Movement. The way the Gezi Portests have been handled by Erdoğan and the AKP has also intensified anxieties as to the sincerity of the government in terms of the 2nd stage of the Kurdish peace process. 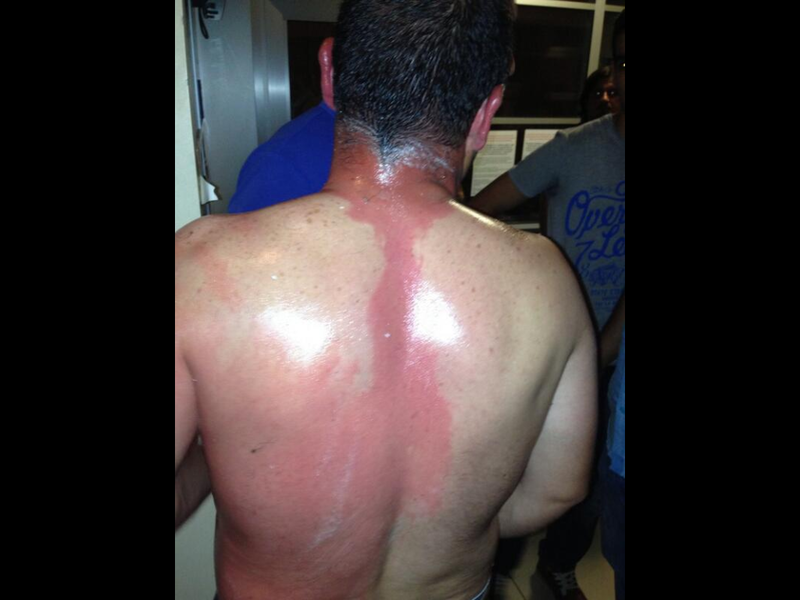 In this sense, the link between the Gezi Protests and the Lice incident is of importance. Within the framework of peace negotiations, the PKK agreed to withdraw is physical (armed) presence from within Turkish territories and started a gradual pull out on the 8th of May. This phase of the peace process – ending armed conflict and withdrawal of the PKK- has been referred to as the first stage. The second stage will require the Turkish political system to incorporate the demands of its Kurdish constituents by making reforms to the political system that enable the creation of democratic mechanisms which will enable a political solution to the Kurdish problem. As such, the second stage is all on the shoulders of the Turkish government. First, the reason there was a protest in Lice in the first place was because the number of police headquarter constructions have been increasing ever since the PKK started withdrawing from eastern provinces. This move can only be seen as an attempt on the side of the government to fortify regions that have been evacuated by the PKK. On top of this, Lice is not even close to the border and the construction of kalekols (a play on words from ‘karakol’: ‘karakol’ means police headquarter whereas ‘kale’ means fortress) are completely at odds with the spirit of the peace process in the first place. Second, protesting against the construction of police headquarters, especially in its current context, is a natural right. Third, I find it impossible to believe that the government had not predicted or at least factored in the potential of protests against such constructions. This incident clearly highlights one of two possibilities, each as dire as the other: Either the government is not serious in terms of the desired outcome of the peace porcess, or there are certain groups within the state apparatus that are deliberately sabotaging the process. Fourth, the central focus of the Lice incident at the moment is on whether the shootings were intentional or accidental. Independent of this, 1 person is dead and 10 are injured, this fact needs to be the centre of the discussion. In connection to the point I made above (in italics), the government has to adress the Lice incident and not try to sweep it under the carpet as it did with the Uludere incident (also called the Roboski Massacre) where 34 Kurds were taken for PKK members and killed by two Turkish Airforce F-16 jets. That time, Erdoğan did all he could to change the domestic agenda and cover up tracks. The government has to find out who is to blame with the Lice incident and bring them to justice. Fifth, the whole policy of erecting or refortifying damaged headquarters in the absence of skirmishes with the PKK has been criticised by the BDP (Kurdish Party). The AKP/Erdoğan has to start heeding the comments of the opposition. Taking a 50% ballot box win as a paper seal to do things on their own, in their own way and to not seek consensus of any form or agreement with its opposition will not solve the crisis. I don’t even want to refer to the ‘Gezi Protest’ as a protest anymore. Resistance is a more appropriate word and is used more widely within the Gezi context in Turkish anyway. Since the Gezi Protests have turned into a resistance against the authoritarian rule of the AKP in general, and of Erdoğan in specific, disparate political movements and identities have joined in arms to resist the “50% voted for us, that is the national will” attitude of the AKP. Proof of this has been the nationwide anger against the use of disproportionate force and the death of a protester in Lice: Yesterday, there were protest marches taking place is Istanbul, İzmir and Ankara (and maybe other cities – I havent had the time to research this point) This example shows that the distance which used to exist between Diyarbakır and Istanbul, between the East and West of Turkey does not exist at the current moment. Whereas violence against Kurds in the east has been a rampant and tragic fact of life in Turkey, it did not provoke anger or support for the Kurdish cause in western hubs like İstanbul, Ankara or İzmir (at least not on mass). This time it has: The Forum notes that I have read for the 28th of June (for multiple cities) and the Yoğurtçupark forum (Istanbuk) that I attended was dominated by the Lice incident. From the other side of the coin, the support given to the Kurdish cause by the overarching Gezi Resistance (Socialists, Alevis, Sunnis, Anti-Capitalist Muslims, LGBT, Nationalists to name a few) will most likely result in Kurds throwing their support even more than they have behind the resistance against the AKP. On this note, my own observations throughout the resistance has been that at times, the nationalist rhetoric used by the protesters had the undesired effect of isolating the Kurds from the movement. Not only that, but also the fact that the AKP have come closer (at least on the surface) to finding a settlement to the Kurdish problem might have resulted in a higher support rate for the AKP. As I mentioned above, the government has been dragging its feet when it comes to legislative reforms and have intensified the construction of police headquarters in volatile regions, which are at odds with the peace process. This will only bolster the ranks of the resistance and increase the percentage of the public that feel threatened by the AKP. Both in terms of the peace process and the anti-AKP resistance in general, the ‘second stage’ of the action plan needs to get going. In other words, it is imperative for the government to take legislative steps that will enable a democratic track to open dialogue. We have not even come close to the issue of releasing Abdullah Ocalan or at least putting him in house arrest, which will be the toughest step in the whole process without a shadow of a doubt. Facilitating the involvement of Öcalan in the peace process would also be a tactically sound move if the AKP are serious about a political settlement to the Kurdish problem. Update: (June 29: 18.17 Turkish Local Time) Large crowds are already gathered and still growing in Taksim Square (Istanbul) and Gundoğdu Square (İzmir) this very moment. 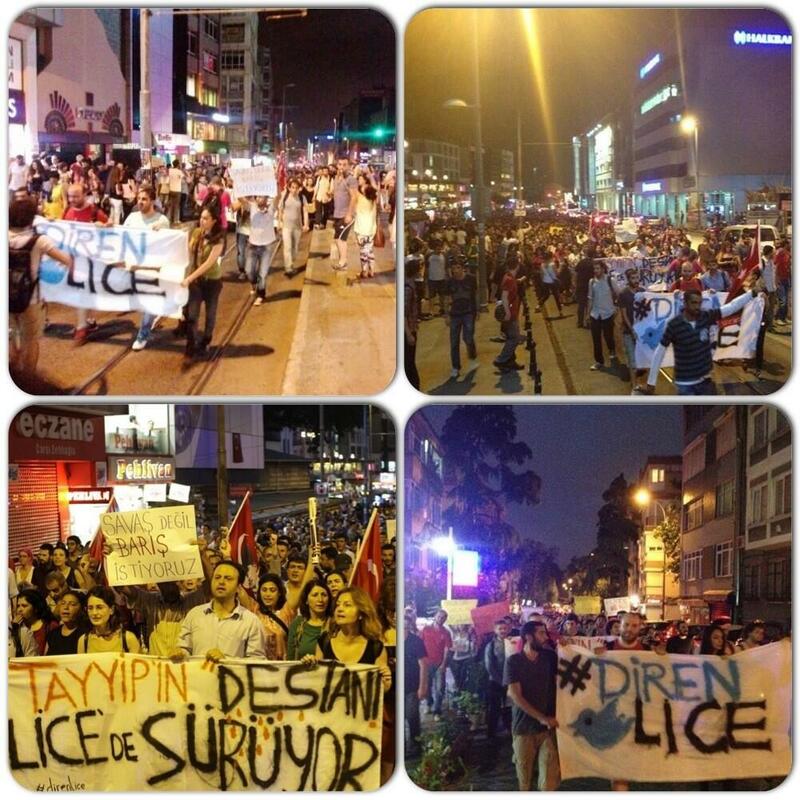 They are asking for justice and standing in support of Lice. My latest post (yesterday) summarises the magnitude of disproportional violence perpetrated by the police and the attitude the goverment has assumed. Today, domestic news outlets have picked up on yet another case which can only be described as torture. A video footage of five police officers in Istanbul (Sancaktepe) beating up, dragging through the street and leaving the limp body of Hakan Yaman has been handed to the Office of the Public Prosecutor. “This is an undeniable case of torture. As if the beating was not enough, they gouged out his eye and on top of that thinking he was dead, through him into the fire. These monstrous actions can be seen in recorded footages”. Without wanting to sound like I am defending the police, the footage which I have linked below is not clean enough to make out exactly what is going on. Having said this, the medical report that has also been handed to the Public Prosecutor shows the burn marks and all other inflicted wounds. Peaceful protest with carnations have provoked the police to use TOMA vehicles at around 9PM (Turkish Time – two hours ahead of GMT). In order to commemorate those that lost their lives during the protests and to remind their demands, Taksim Solidarity invited all to congregate in Taksim with carnations at 5PM today (June 25th). After stating that the protesters were “occupying a space open to the public”, the police started using TOMA water cannons to disperse the crowds. Estimates predicted “tens of thousands” of protesters. 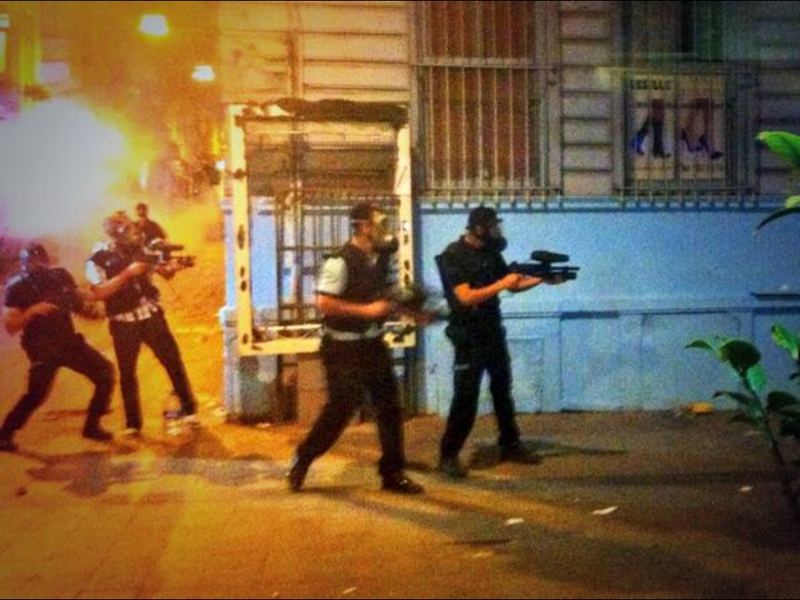 Update: 10.34 Police have been using water cannons and tear gas intensively over the past hour. Twitter feeds are telling residents in Cihangir, Sıraselviler and other neighbourhoods in Taksim to leave their doors open for people to seek refuge. 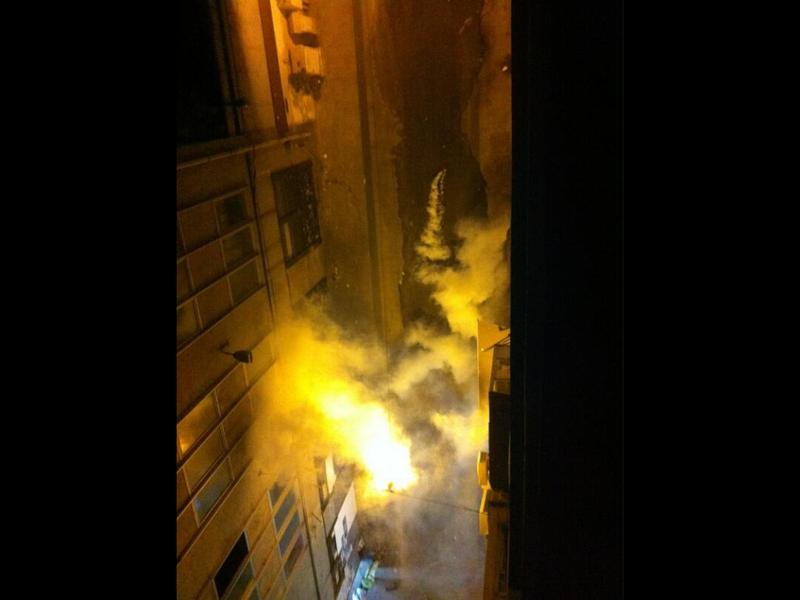 The tear gas in side alleys are especially bad. Once again, disproportional police violence! Update: 10.40 CNN Turk, one of the channels criticised heavily for being the mouthpiece of the government have just pulled away from their live feed at Taksim. They are showing constructions that TOKI (state funded) have been erecting. Update: 10. 42 . The police are only lightly hitting protesters with battons on Istiklal Street (Taksim Highstreet) but is going heavy on protesters in side streets. 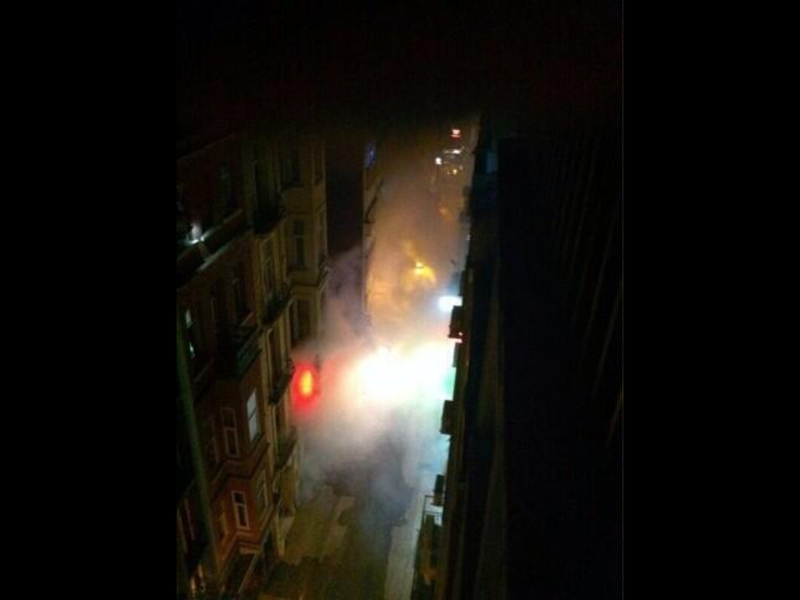 People are being warned to not flee the tear gas into side alleys..
Update: 10.55. Just occured to me, police told people to evacuate Taksim Square, waited for literally 30 sec. and started firing cannisters and moving forward. So why are they waiting down in Cihangir (one potential exit route from the Square)? The only answer is that they want arrests. 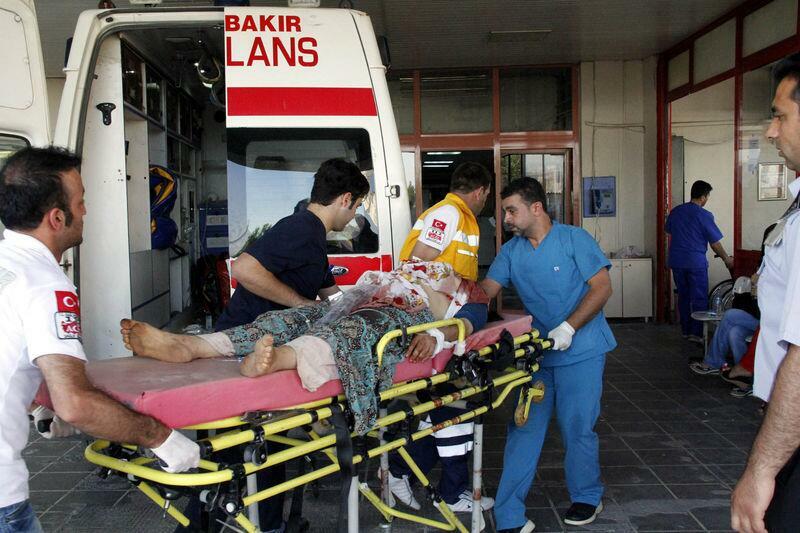 Update: 9.09 gmt Earlier I stated that Ankara was in a bad state. 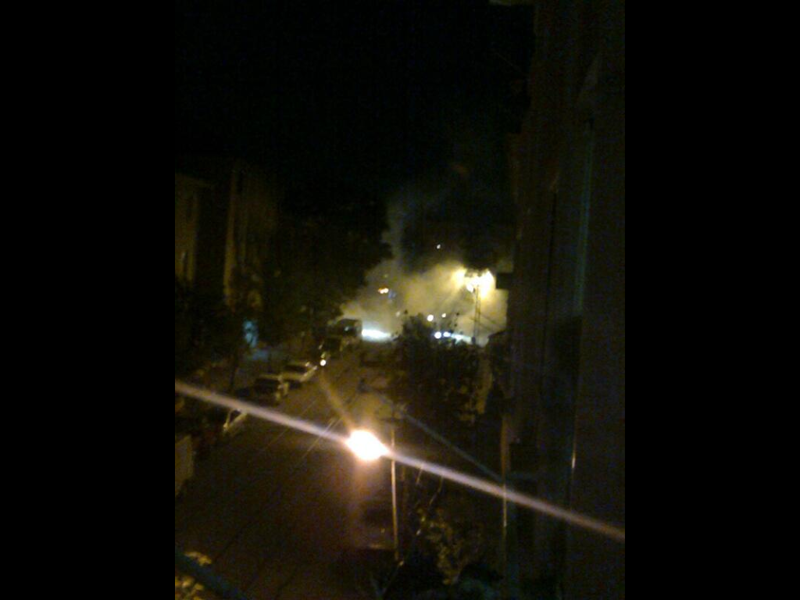 Further confirmation shows heavy use of tear gas in Dikmen. I wonder what the political landscape would look like if we had a 3%-5% barrier in national elections. It wouldn’t be about the tyranny of the majority, that much is for certain. 1.03 am: and it continues, police gassed istiklal street, protesters flee down side alley right into the arms of police with shields and battons. Nice way to ‘disperse the crowds’. Coercion, Surveillance, Censorship: Brace yourselves for the new Internet Law!